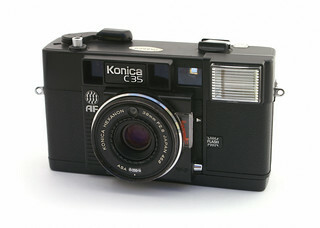 The Konica C35 AF (nicknamed "Jasupin") is a milestone camera in that it was the world's first production autofocus camera. Launched in November 1977, it used the "Visitronic" AF system developed and produced by Honeywell (see below for description). This was a "passive" rather than the subsequently more popular "active" system (which Canon utilized in the AF35M eighteen months after the C35 AF). Konica is said to have sold one million units. In 1980, the C35 AF was superseded by the C35 AF2 with some cosmetic differences. Some years after the launch of these Konicas, the Russian Belomo factory in Minsk output an autofocus camera that owed a huge debt to them. 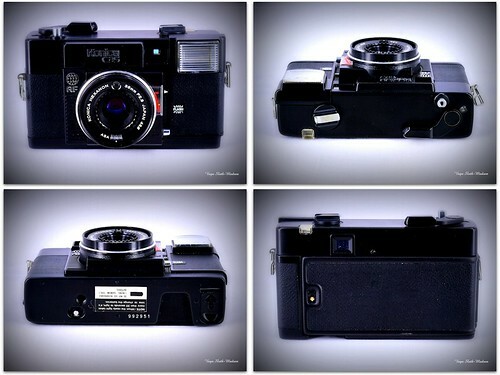 It was called the Elikon Autofocus, but has only been seen with Cyrillic lettering. Features: Lens cap obscures viewfinder to prevent errors! "Designed by Honeywell for 35 mm cameras (visible light), uses a separate set of detectors and charge coupled devices along with a microprocessor to effect automatic focus. A correlation is performed between sets of detectors utilizing two different, widely separated small areas of the aperture. The technique is based, as in optical rangefinders, on the angular difference between separate receivers in superimposing the same scene. This technique effectively determines not only whether the system is out of focus, but the amount and direction of lens movement required to achieve optimum focus." 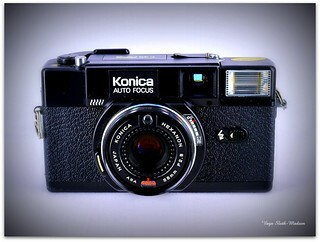 Konica C35 AF listed at number 9 in Jason Sneider's Top 20 Cameras Of All-Time on Shutterbug. This page was last edited on 22 March 2019, at 02:15.